Yammer is a social networking service, that provides employees a dynamic platform for communication and content sharing. While applications such as Microsoft Teams and Planner also feature communicative components, these tools are geared towards established, likely intra-departmental, groups of employees. Yammer, on the other hand, provides an outlet for organization-wide contact, promoting the exchange of ideas and projects from otherwise disparate groups. This intuitive platform supports the natural development of communities of interest, crowd-sourcing ideas and initiatives, and building transparency around company expectations and best practices. Yammer's home page was designed around common social media features. The main feed is foregrounded, updating in real time with employee posts. Users have the option to share information via an "All-Company" update, where they can attach images, gifs, and files. Yammer also now offers high-quality uploads from YouTube, and embedded videos from Office 365 and Microsoft Stream, ensuring continuity across security controls and infrastructure. In the top right hand corner of the screen are three icons: a house, letter, and bell. The house icon redirects to the main feed, while the letter opens to the user's Yammer inbox. In this inbox, users are able to view their unread, private, and reviewed messages. Rather than posting to the main feed, employees can tag specific groups, or send messages privately to one another. The bell keeps track of any notifications, or posts in which the user was mentioned. In addition to text updates, users can create polls on the homepage. After creating a question and set of answers, people can easily communicate timely preferences or feedback with one another. Right of "Poll" is the "Praise" option, which encourages employees to highlight one another's accomplishments. 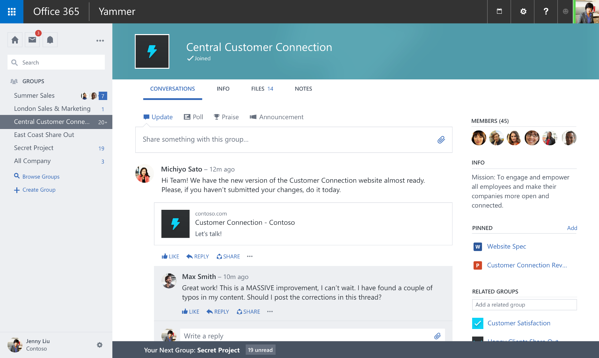 In addition to personalizing updates with external files and images, Yammer also allows users to share content from SharePoint. Because Yammer integrates with Office 365, intelligence from Microsoft Graph makes it easy to search for people, files, groups, and conversations, while analytics provide an overview of network activity. 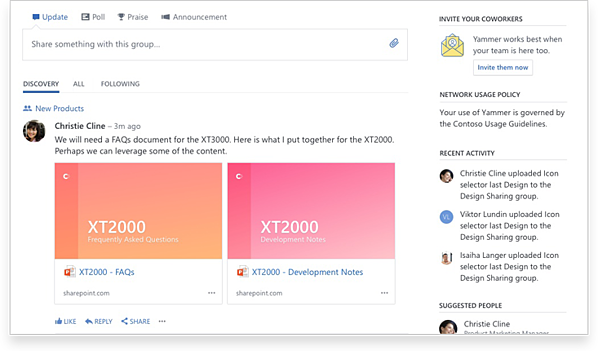 Yammer can also leverage Office 365 Connectors, which pull relevant 3rd party content (such as industry news and highlights) and add it to user groups. Both the mobile and desktop applications were built with enterprise-level security, compliance, and management features, ensuring safe social sharing. And Azure Active Directory ensures that groups are automatically updated as people join, leave, or move within the company. Giving every employee the space to contribute to their company's evolving vision. Effectively tracking and sharing progress, so that employees are constantly building off of one another's achievements. Providing easy to use and intuitive threads that bind the business. Ensuring that collaboration is preserved, by automatically syncing to the cloud. Allowing users to join external Yammer networks with ease, and safe-guards in place. These are just some of the ways that Microsoft's Yammer is shaping employee collaboration, and improving company culture. Contact an iCorps expert today to learn more about optimizing the many resources Microsoft's productivity suite has to offer.